In a previous post I have shown you how to install Windows 10 (Technical Preview) on VMWare Fusion.If you would like to install the Windows 10 in a real computer or notebook, you need to burn the iso image to a DVD or USB flash drive and boot the computer from this media. In this post I would like to guide you how to create bootable Windows 10 USB flash drive. 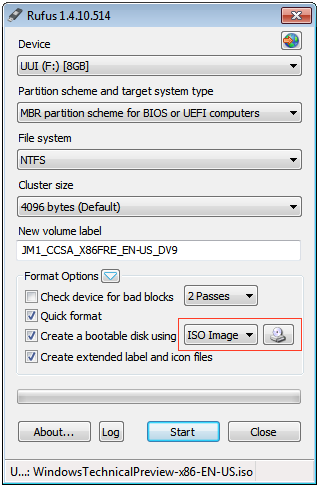 It is very easy to create this USB bootable disk. What you need is a USB flash drive with 4GB of capacity or more, the Windows 10 iso image, and a utility to create bootable USB flash drive. I choose Rufus as the utility. It is simple, small, and lightweight utility software to create bootable USB flash drive to install almost any operating system for your computer / server / laptop. You can download the Rufus from here. 3. Download Rufus utility. Once downloaded, double-click to run Rufus. It will automatically detect your USB flash drive and set it as the target device. You can verify this by clicking on the Device drop-down menu. 4. I just left everything set by default, except the option “Create a bootable disk using….”. Set it to us ISO image and point it to the Windows 10 iso image file you have downloaded in the step 1 above. 5. You are just set and ready to click Start button to start creating the bootable flash drive.